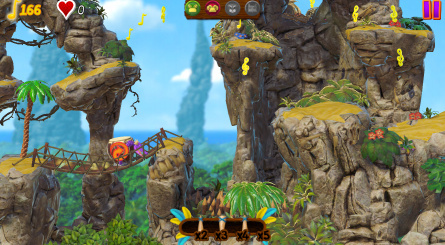 FortuneFish - the studio founded by former Rare owners Tim and Chris Stamper, along with Tim's son Joe - has released a test version of its new music-based platformer on iOS which calls to mind the classic days of the legendary Donkey Kong Country studio. Kroko Bongo: Tap to the Beat! is billed as a rhythm platformer and boasts attractive visuals and character designs which wouldn't look out of place in a new Donkey Kong outing. The main character looks a lot like King K. Rool, if you ask us. 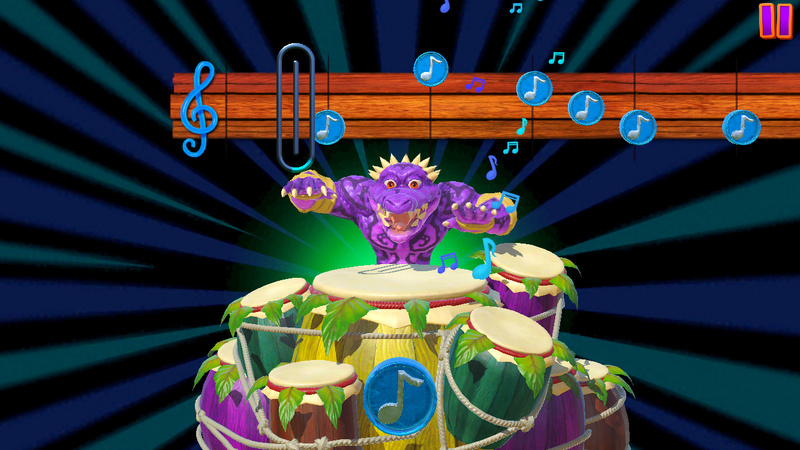 Kroko Bongo is a new rhythm platformer, download for free on #iPhone now! Interestingly, the game is entirely free to download and doesn't feature any annoying adverts. What it does contain is "perfect music synchronisation", "pixel perfect timing", "branching paths and top secret routes" and a unique soundtrack for each stage - the latter of which fits in with the David Wise and Grant Kirkhope-penned tunes written for many of Rare's most famous platformers. Even the sound of collecting the in-game musical notes sounds exactly like the banana-grabbing one from the DKC series. Remember in Kroko Bongo, your ears are just as important as your eyes so turn up the volume and enjoy! Thanks to Andy Robinson for the tip! The game sounds like Donkey Konga and plays like Jungle Beat. Neither a coincidence. This game more than brushes with plagiarism at every turn. "For the very reasonable price of free it's well worth a look"
Still too expensive. I'm joking. I'm joking. Check out the purple croc at 0:23 lol. Where will they get their ideas from next..
Kind of reminds me of harmoknight. Donkey Kong + Spyro Dragon + Alligator ?? "You should extend the levels more and see if you can port it to Nintendo Switch's indie e-shop." "Game is still in very early stages, so I can't confirm anything but I can say we have big plans...just bear with us!" K! B! 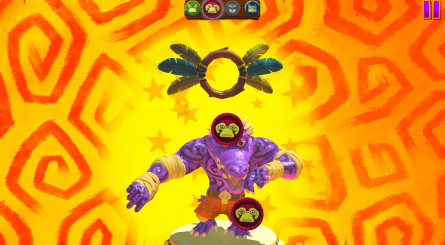 Kroko Bongo!! K! B! Kroko Bongo's here!! It doesn't quite work but you get the idea. @Joytendo22 Um Bongo Um Bongo, they drink that in the Congo, right? No Android version? That's a shame. @Akropolon This is just a test release and the full game will apparently be coming to Android. FortuneFish has supported Android with its previous games. The aesthetic may seem DKC-ish, but the gameplay (the important bit) looks like Bit.Trip Runner or Rayman Legends' musical stages. I just saw "Donkey Kong Sequel" and insta-clicked into this. Kinda regret it. I can see this failing miserably on Switch. The game play should have just been another tried-and-true platformer and that would have been enough to make a splash. A few good ideas: taking the "O.C." and adding a few more "O.C. 's" in the same "realm", play-styles that "Switch" with characters, getting a good, underground team to do the music, tight controls, and a mildly-interesting story to keep motivation balanced between "Why?" and "Woo!". It looks and sounds great! The fact that it's rhythm-based kinda disappoints me a bit, but given the pedigree behind it, I'd definitely give it a chance om Switch. Always interested to see what some of my favorite past developers are doing now. I don't play mobile games but it is free and it looks interesting so I may actually give this a download. Would had being nice if it wasn't a rhythm game, the platforming looks fun. Kremlings in purple. Yes please. Can't wait to try it. Hopefully it comes to android and switch. Wishful thinking that they buy back rare! @Damo Perfect, I'll just wait for that one. I'm guessing I won't spend more than half an hour on this, but still somewhat curious. I need this! These great developers should make an expanded version for all consoles... a real platformer? I would buy it day one. The plagiarism accusations in the comments section are hilarious. Perhaps it's because of their inherent talents? It's like saying Picasso plagiarised himself. And genres, they are all already invented. @JaxonH Noooooo! Not the minecart levels. What I'd ever do to you? Did you ever play DK Jungle Beat, I remember you buying it? 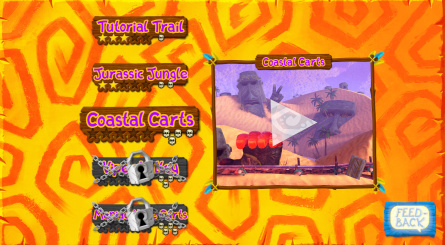 I don't recall there being any minecart levels in there considering as how I liked the game. Maybe some really easy ones where you couldn't die, just jump to get more bananas? I'm usually not one to cry "clone", the whole world has been a clone since the Bible, Gilgamesh, Shakespeare and Journey to the West, but I'd be hard pressed to tell the difference between that 30 second trailer and 1 for DKJB. You know what's funny, the first 3x I watched that trailer I thought the notes were bananas, I had to enlarge it to tell they were notes, thats' how much it looked like DKJB to me. Good job w/ the Wii U like graphics on a phone though. Why is everyone saying 'Spyro'? He's obviously a purple Kremling. Which is fitting. Anyway, does anyone know why this guy has... fur? Would probably buy on Switch as I'm a fan of rhythm based platformers. That's the Spyro colour scheme. Feels like a Donkey Kong Country version of Super Mario Run. Seems like a good runner and its always a huge plus to have ex Rare employees involved. Too bad I'm terrible at rythym games. I'm usually very negative about mobile phone games, but this actually looks good. Doesn't look too bad, but games that can be played on a phone usually don't have the control complexity + tightness I desire in my video games. Rhythm games can be an exception though, if they're good. I can play this garbage on my phone. All we need is more mobile shovel ware flooding the Switch like they tried to do on the VITA. Nah not really feeling this one. Unless they release it for Android devices before I visit my parents I'll try this out on my parents Apple devices. Looks like pretty much every other free running mobile platformer but since this brings back so much nostalgia from DKC, I want to try it out. It's free afterall, I have couple of minutes to waste for this. Lol, they are copying their own games! The game does look very cool though. But on Switch it will cost 10 Euro or more, its always that way! 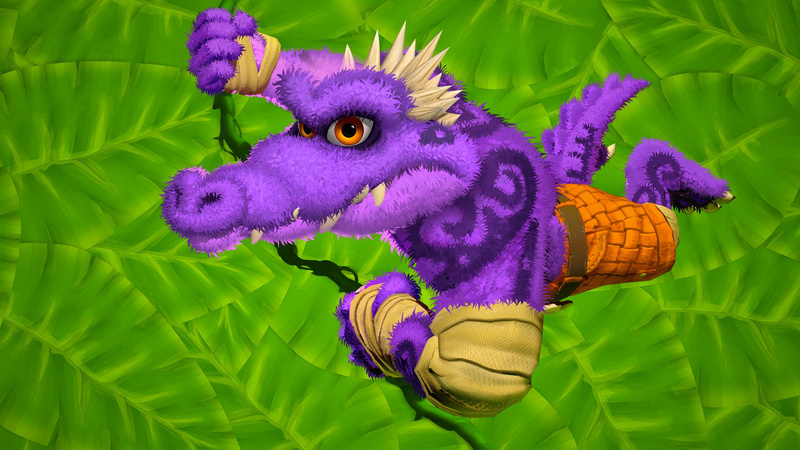 I think what you mean is Kroko looks like a Kremling (that which K. Rool is as well) but yeah, this game is really fun. Hope it gets ported to Nintendo Switch soon. @NickOfTime90 That was me, I was glad when they responded with that too. @NintendoRules90 ah sorry for quoting you as "some guy". I was just happy hoe they responded as well, thanks for asking the good questions mate. @NickOfTime90 Hey don't worry, believe me I've been called worse. Yeah, I don't blame you, I know a potential good game when I see it and am always willing to ask the right questions whenever I can.